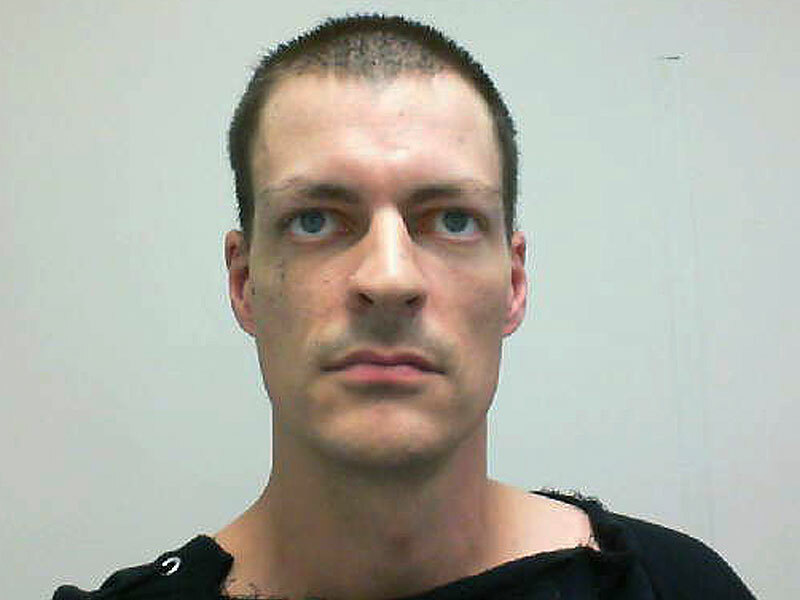 34 year old Nathaniel E. Kibby was arrested and charged with felony kidnapping of New Hampshire teen Abigail “Abby” Hernandez in Conway, New Hampshire. Kibby was arrested by police without incident at his home in a trailer park in Gorham, NH, about 30 miles north of Conway. Abigail “Abby” Hernandez went missing on October 9, 2013 after she left Kennett High School to go home. ”Abby” Hernandez suddenly returned home, after missing for months, on July 20, 2014. Kibby is scheduled for arraignment Tuesday at 1:00 pm at Conway District Court. A 34-year-old man was charged Monday with kidnapping Abigail Hernandez, the New Hampshire teen whose case has brought a national spotlight to the small mountain town of Conway, where she went missing nine months ago and was returned to her family last week. Nathaniel E. Kibby was arrested at his home in Gorham, N.H., the state attorney general’s office said in a statement. He was scheduled to be arraigned in Conway on Tuesday afternoon. Officials said Kibby is accused of “knowingly confining” Hernandez on Oct. 9, 2013, “with a purpose to commit an offense against her.” They did not release any further information. Nathaniel Kibby is accused of confining the teenager who disappeared on Oct. 9 after leaving school for the day. Attorney General Joseph Foster said Monday that law enforcement officials have worked around the clock to determine the facts surrounding the girl’s disappearance and return. He said Hernandez told police details that led to Kibby’s arrest. Hernandez was held in a locked storage container behind Kibby’s trailer, a neighbor and friend of the girl’s told New England Cable News. Kibby is scheduled for arraignment Tuesday in Conway District Court. It was not immediately known if Kibby has a lawyer. Foster said he will have a media briefing after the arraignment. State Police are asking anyone with information regarding Kibby and any activity at his residence since October 9, 2013, is urged to contact the State Police at 603-271-3636 or the Conway Police at 603-356-5715. Abigail Hernandez Who Went Missing on 10/9/13 in Conway, New Hampshire Has Been Found Alive & Safely Returned to Her Family!!! Abigail Hernandez has been found ALIVE!!! New Hampshire State Police and FBI have announced that Abigail Hernandez has been found alive and was safely reunited with her family Sunday evening after missing for nine months. Abigail Hernandez has been missing since October 9, 2013 when she was last seen leaving Kennett High School in Conway, New Hampshire. The family posted it was requesting privacy at the moment on the website BringAbbyHome.com. New Hampshire State Police and FBI have announced that Abigail Hernandez was safely reunited with her family Sunday evening. Abigail Hernandez went missing on October 9, 2013 as she was leaving Kennett High School in Conway, New Hampshire. The facts and circumstances surrounding Abigail’s disappearance continue to be actively investigated. ABBY HAS BEEN FOUND SAFE!!! Police and prosecutors are not releasing details on the circumstances of her disappearance due to ongoing investigation. “Further details will be provided once it has been determined that releasing additional information will not compromise the integrity of the on-going criminal investigation,” a press release from the New Hampshire State Police and Attorney General’s office said. The Hernandez Family has requested privacy as they assist the ongoing investigation. For more updates, comments, opinions and to provide your own, go to Scared Monkeys Missing Persons Forum: Abigail Hernandez Found Safe. 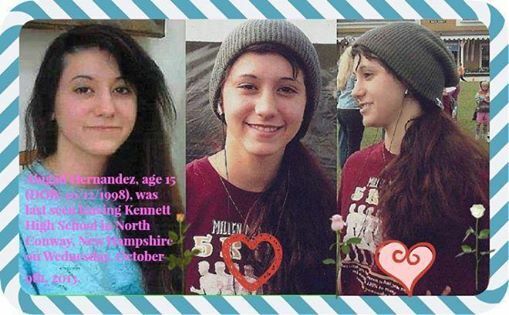 15 year old Abigail Hernandez has been missing since October 9, 2013 from Conway, New Hampshire. Abigail was last seen leaving Kennett High School in Conway. Police say she walked her normal route toward home and sent several texts between 2:30 p.m. and 3 p.m. But she never made it home. Her mother is offering a $10,000 reward for information leading to her safe return. Zenya Hernandez said she decided to add the additional reward money, the FBI has a $20,000 reward offered, to create a greater reward for someone who can bring her daughter home. For more updates, read others comments and to provide your own go to Scared Monkeys Missing Persons Forum: Abigail Hernandez. Anyone with information is asked to call either the Conway Police Department’s tip line at 603-356-5717 or the FBI at 1-800-CALL-FBI. Calling it “unprecedented,” law enforcement officials announced during a news conference on Friday that a missing New Hampshire teenager who disappeared two months ago on her way home from school wrote a letter to her mother that was postmarked two weeks after her disappearance. Officials say they kept quiet about the letter for a month out of fear that releasing it publicly would compromise the investigation. Ramsey noted that one of eight endangered runaways ends up being sexually exploited. “And at this juncture, we believe in fact that it was written by Abby and was sent to her mother,” Young added. Neither federal nor state authorities would discuss the contents of the letter beyond Young saying the writing is in “a tone Abby would have used,” and that the letter underwent “expert analysis” before its existence was announced publicly. Officials also said revealing details about the letter could potentially trigger “copycat” letters that would slow down the investigation. The letter was written on October 22, and postmarked on October 23, according to Young, and it was turned over to authorities for investigation after Zenya Hernandez received it nearly two weeks after it was postmarked. “When we received this letter I will tell you it was unprecedented. We have not seen anything like that in recent times in other investigations, but most importantly, it gave us hope,” FBI Special Agent Kieran Ramsey said at the news conference. If anyone has any information regarding Abigail Hernandez’s whereabouts, please contact the Conway police at 603-356-5715. The FBI has released new information and put together a timeline in the disappearance of 15 year old Abigail Hernandez in Conway, New Hampshire. 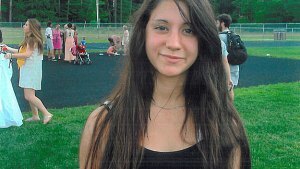 Abigail Hernandez went missing on Wednesday afternoon, October 9, 2013 after she left she left Kennett High School and was walking on and walking on a powerline trail. However, investigators had firth thought that Abigail Hernandez returned home after school, now they are saying that she never did. The FBI has created a timeline of events from interviews and surveillance video gathered. Abby was seen leaving school at 2:29pm last Wednesday and exchanged a series of texts with a classmate between 2:23 and 2:53pm. At 2:35pm, she was seen walking on the power line trail from Eagle’s Way. There were multiple unconfirmed reports of someone matching Abby’s description between 2:40 and 3:30pm walking on the North-South Highway. Her last cell phone activity was at 3:07pm when she sent a text message to the same classmate on the west side of Cranmore Mountain. Investigators are also asking the public to be on the lookout for Abby’s white iPhone 5 with a pink and grey case. UPDATE I: FBI officials express growing concern for missing NH teen’s safety. FBI officials say they have “significant fears” for the safety of a New Hampshire teen missing for more than a week. Investigators shared their growing concern for 15-year-old Abigail Hernandez Saturday. Anyone who may have any information about Hernandez is asked to call 1-800-CALL-FBI or submit a tip at www.tips.fbi.gov.